The Bride is arguably the second most famous "ghost" in the Haunted Mansion (after the three Hitchhikers, whom I shall count as one single character here). She's one of the very few "stand alone" gags in the ride, meaning she isn't part of a scene, she is the scene. Plus, there is just something inherently eerie about a wedding dress in an attic, but with the added faint wind blowing through the gown, the iridescent, glowing figure within the gown, and, of course, the glowing, beating heart within the Bride's chest, the creepiness is fully enhanced. 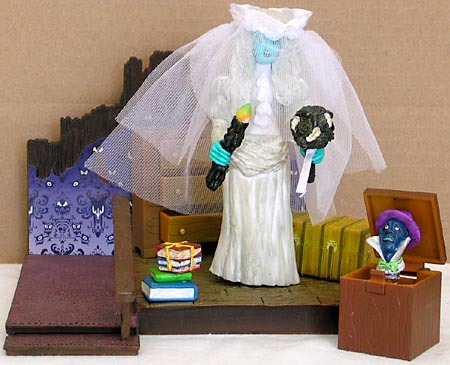 A bride character was something that appeared in several versions of the proposed Haunted Mansion ride, often serving as a major story element. She is such in Disneyland Paris's Phantom Manor (a total rethinking of the Haunted Mansion ride) and actually is the "hero" of that ride's narrative. At any rate, though, she is a very popular ghost and therefore makes an obvious choice for this toy line. The sculpt is fairly simple and unexciting. There is some nice wrinkle work, but detail certainly isn't a word that comes to mind here, though she does have the most of it out of all six Mansion figures. What saves the sculpt (just like with the theme park exclusive Indiana Jones figure) is the simple paint wash. It's a light gray that just brings out the wrinkles and adds some depth to the figure - a perfect example of how paint can improve sculpt. Her hair is a separate piece, cast in the same soft PVC as her skirt, but while it does allow some movement, all it really does is inhibit the neck articulation. It's also very disproportionately big, adding to the goofiness of the design. The likeness is similar but not close. Her face isn't really her trademark and she does have a veil to cover it, so it's not really that big of a concern. 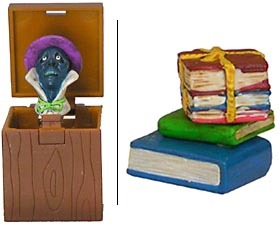 I suppose it is rather important to note that, at least sculpturally, these figures are certainly intended for kids, not collectors. There's very little detail, all likenesses are off, and basically the figures are very simple all around. What's weird, though, is the amount of articulation. The Bride has 12 points (that's more than most Mattel action figures!) - neck, balljointed shoulders, elbows, wrists, waist, balljointed hips, and knees. First, I find that very impressive for something that, again, at least sculpturally, seems aimed at kids, and secondly, the balljointed shoulders are plain shocking, but very welcome, for something like this as they add a great deal of posing options. So, who likes accessories? Apparently the Bride does (I'm tempted to do a "bridal shower of accessories" type joke, but can't really come up with a good one), because she comes with seven, and some are pretty cool. She has a veil made of cloth (I don't know what it's called, but it looks like screen or scrim material to me, as it is translucent) with one small piece in front and double layer in back with a frilled (but sadly not thrilled) piece of elastic to hold it in place. One can either just rest the veil on the top of her head, or stretch out the elastic to encircle the humongous hairpiece, the latter being the trickier feat of the two. She also comes with her trademark candle and bouquet. 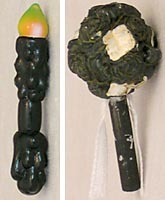 Neither are very ride-accurate, as the candle is black with a multi-colored "flame" and the bouquet is fairly small, but is cast in black with a wash for detail and some multi-layer paint for the flowers. The bouquet also has some ribbon for effect, but the "handle" is soft PVC and tricky to operate. Also included is a hinged trunk (with a nice brown wash on it for effect), a chest of drawers with three working/removable doors (again, with good paint wash), a box with a (not very effective) latchable lid with a pop-up ghost head on a spring (a great addition as the attic is full of these things), and a stack of impressively painted books (with the covers in one color, the pages in white and then a wash on the white for effect - very cool!). 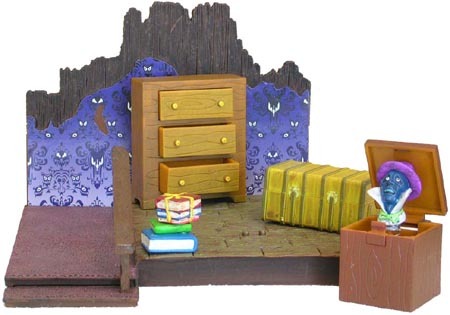 And finally, the base - I'm assuming it's supposed to be the attic, though I don't recognize it at all. On the left side of the base is a sort of carpeted walkway (with pink and black washes for color) with a railing; the right side is a pretty cool mishmash of weathered old boards (with a green wash) that don't quite match up. On the old boards are two little pegs for the Bride's particularly small feet to aid her in standing. Then there is a jagged wooden backdrop with a sticker of the famous hallway wallpaper on it. This is a fairly weird base, but the exposed floorboards are pretty cool and I'm a fan of anything that involves the wallpaper, plus it does overall fit the feel of the attic, so it's cool. A mediocre figure, an okay base, a plethora of accessories and more articulation than the figure deserves, all for $14? I say okay! After all, it is an exclusive and the articulation, accessories, and simple paint do help push the figure a long way toward coolness. It's not my favorite set in the series, but it's still worth having. Oh, and did I mention there's a button in the Bride's rump that lights up her heart? Just like real women! Better Bride: Uma Thurman or Haunted Mansion? Tell us on our message board, the Loafing Lounge.